I did say that I probably would be doing more elephants before mid November. This one, fresh off the drawing board, measures 5 3/4" x 6 3/4" and is one of the smaller works that will accompany me to this year's Waterfowl Festival on Maryland's eastern shore in a bit over a month and a half. Delivered nine works yesterday to the beautiful Halcyon Farm in northwest Baltimore County for this coming weekend's big Art for Land's Sake art show/fund raiser for the Valleys Planning Council. I am most pleased to have been invited to participate, for the first time this year, in this every-other-year event. Open to the public on Saturday, October 1 and Sunday, October 2 from noon to 4PM, the weekend should be very fall-like out in the countryside and you will see some fine art works by local Maryland and close by artists. It will be well worth a drive out to the country on either day! 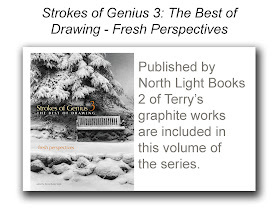 Here, then, are two more smaller scale works off the drawing board in the last couple of days. 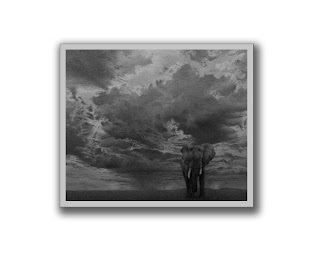 I have not delved into Africa too much of late but just had to include several elephant works for the big November show. 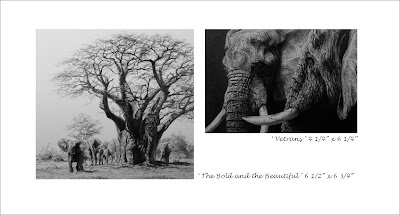 I've not done elephants, my favorite subjects, in quite a long time and found working on these two pieces to be so compelling in pulling up all sorts of memories of time spent in Africa; much needed reminders of just how much I love that place. I have a feeling that these will not be the only two works to include my favorite subjects that shall come off the old drawing board over the next month or so. This weekend marks the opening of the 32nd International Marine Art exhibition at the Maritime Art Gallery at Mystic Seaport on the Connecticut coast. My work, Pennies From Heaven, will be one of over 100 works included in the show. The exhibition/sale runs through mid November so there is plenty of time to see some fine maritime oriented works. The reception and jury selection for awards happens this Saturday. I've been a busy worker bee the last five days preparing for the upcoming mid November Waterfowl Festival here on Maryland's beautiful eastern shore. I've lost track but feel sure this will be my 19th year of doing the show. These three smaller sized works are all under 5 x 7 inches in size and are the first batch of small scale works that will be coming off the drawing board over these next five weeks. Larger works for the show are already inventoried and set aside, but I hope to complete at least a dozen more of these miniature works for the Festival. Long hours ahead in the studio! 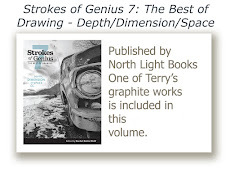 I was pleased to receive word over the last 24 hours that two of my draft horse works have been warmly received out there in the big, cold world. All Dressed Up, which was a part of this year's Western Visions Show at the National Museum of Wildlife Art in Jackson, WY, was sold during the Intent to Purchase sale on Friday evening. Up for the Challenge, a part of this year's members' exhibition of the Society of Animal Artists which opened in Michigan over the weekend, received an Award of Excellence on Saturday. 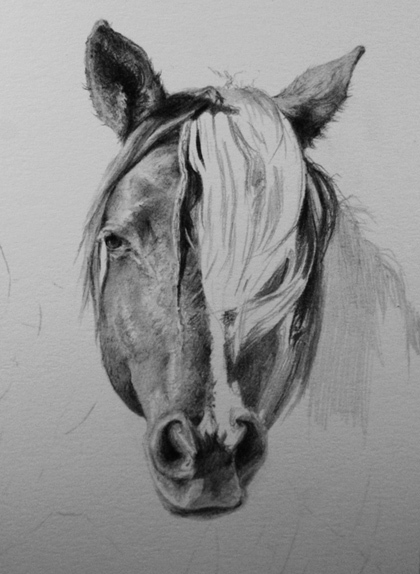 I'm pleased that my equine efforts have been well received! 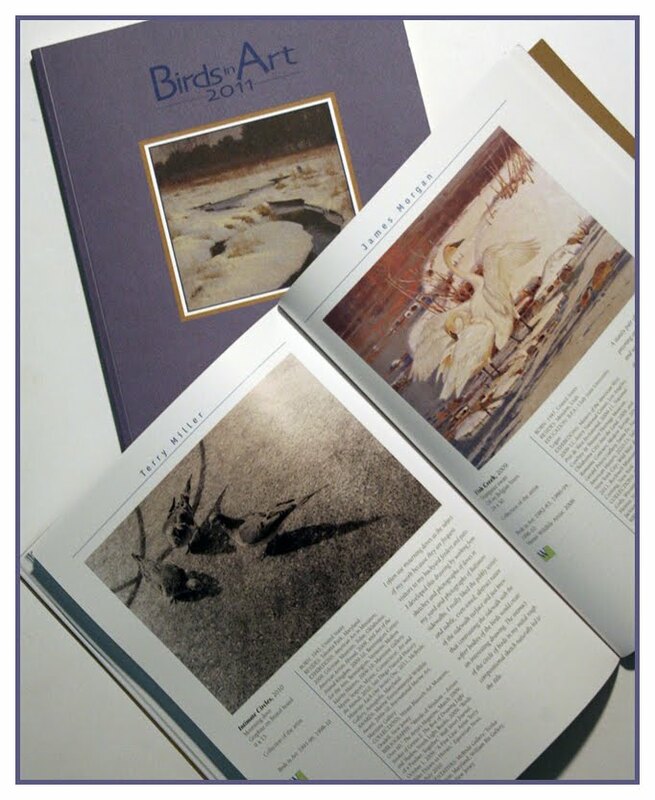 Hard to believe that one week ago, I was landing at Central Wisconsin Airport about now, enroute to the opening of Birds in Art! My, how time flies. Well, I've been back at work this week needing to complete the last of three works to head out to the Pacific Northwest shortly for the Howard/Mandville Gallery's 2011 edition of their annual Small Works Show next month. 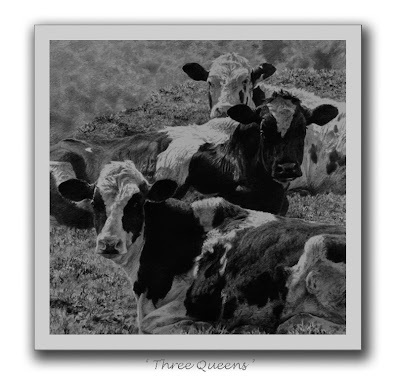 So, here are the three ladies I have had on the board this week. This one is just over 7" square and will be available at the gallery on October 15th during the 'Intent to Purchase' box drawing that evening. 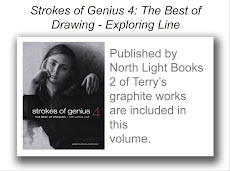 If you would like a chance at this work, you can contact the gallery. It's mid September, I've just returned from the opening weekend of this year's edition of Birds in Art. So, that must mean it's time for a quick overview of some of my favorite works from the exhibition. I've spotlighted 18 works from the 112 pieces but that does not mean, by any stretch, that these are the only works that caught my eye. 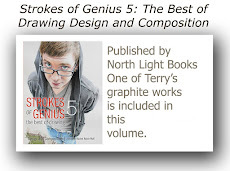 I could, indeed, show every single work and speak about my impressions and joys at seeing them in person, but . . . in the interest of time and space and the fact that I do have to find time to sit at my drawing board yet today, I shall focus on these few works as a very good representation of the overall intensity and highly creative approach that every single juried artist touched upon this year. 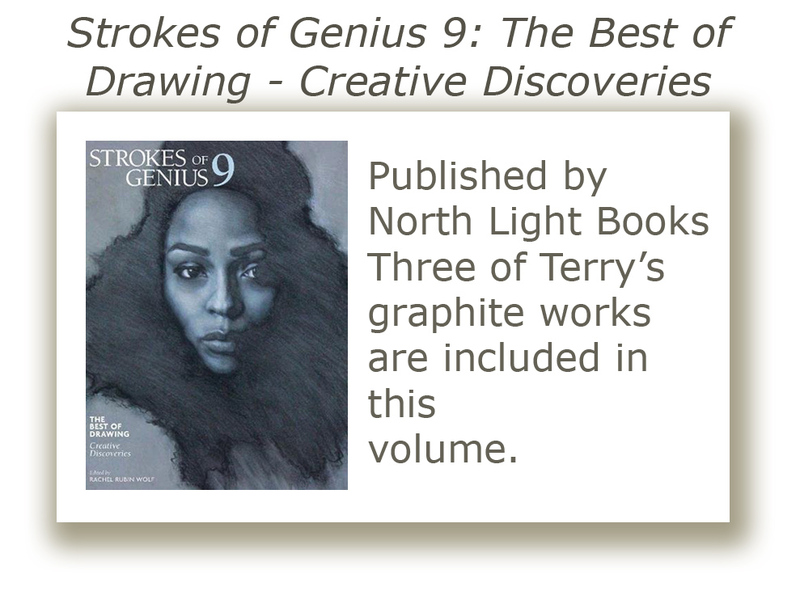 Bravo to the jury of three who dug through entries from hundreds and hundreds of artists from all across the globe to select what they considered to be the cream of the crop for 2011. I guess the best place to begin is at the beginning, with a diminutive work, just 9 x 12 inches, that sits at the top of my top ten list . . . 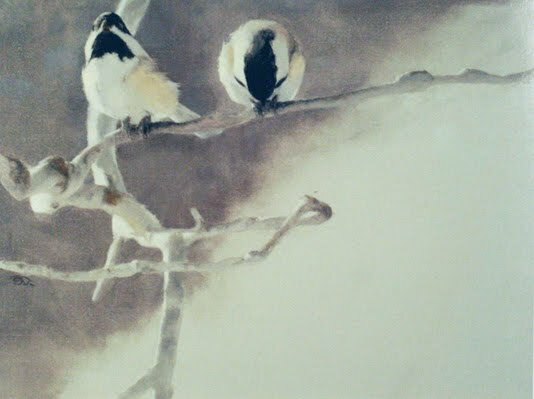 Artist September Vhay, a second timer first included in the 'cut' in 2003, painted this stunning, soft and sophisticated rendering, above, of Black-capped chickadees. 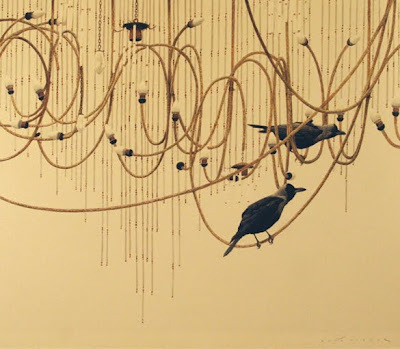 I heard many of the attending artists comment about the beauty of this work, which hung at the entry to the main galleries at the Woodson Art Museum. 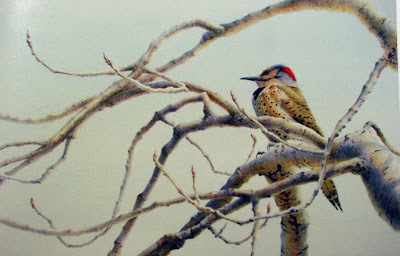 It is no wonder that this piece was on loan for the exhibition from the collection of the National Museum of Wildlife Art in Jackson, WY. Small in stature, yet incredibly captivating, just like its subjects! Michigan artist, Canadian born Catherine McClung who has made the cut 7 times before, drew me in with her beautiful watercolor of a Yellow-shafted flicker. Another relatively small work, this one being just shy of 11 x 17, it held the same sort of impact for me as Vhay's work. Though more detailed in feeling than the chickadee work, this piece, for me at any rate, carried through the same soft instantaneous capture of a moment in time. The 2004 named Master Artist, Canadian Chris Bacon's acrylic of a Barn swallow, below, was another work that stopped me dead in my tracks. At once soft yet striking, I really enjoyed seeing how Chris developed his compositional idea and it really touched me as it certainly was the sort of idea that might have occurred to me, had I thought of it first! Very monochromatic in character, it surely would have read just as strongly in shades of black, white and grey! Englishman Karl Taylor, in his acrylic painting of Indian house crows above, captures almost the same sort of feel that Chris Bacon did on his canvas by deftly incorporating a very 'busy' background with the more subtle poses of his subjects. As in Bacon's rendering, the strong linear quality of the hanging chandeliers here, duplicate to some degree the curvilinear lines of the reeds and reflections in Bacon's work and act as a very interesting yet non-disturbing background. 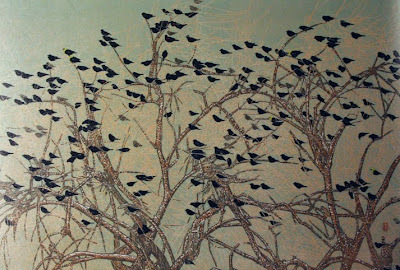 Below, in 2006 named Master Artist Andrea Rich's masterful woodcut of Red-winged, Yellow-headed and Brewer's blackbirds, I was struck by the vibrancy of the piece as well as the overall subtle variations in texture and color. It reminded me very much of the kind of intensity seen in a Pollack. 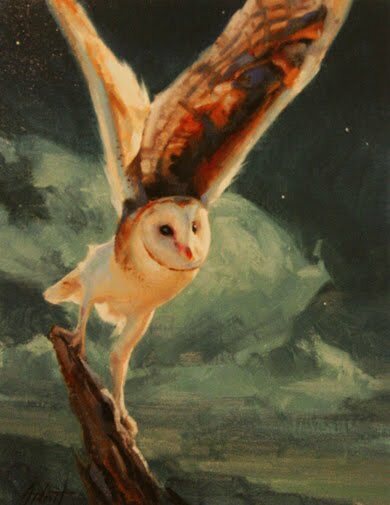 In his 13th year of making the cut of the juror's selection, Colorado artist Ned Aldrich painted a stunning portrait of a Barn owl. Only 14 x 11 in size, it certainly grabbed my attention with its intensity of bold color and bold movement of the subject. 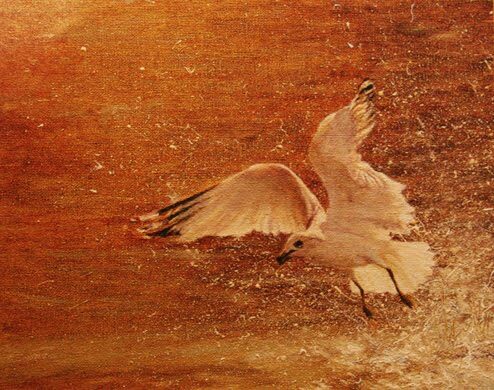 Embodying the character of a plein air work, with its very deliberate brush strokes and seeming spur-of-the-moment capture of movement in the flurry and fuzzy quality of the wings, this work really spoke to me. Another of the works that was small in size, yet large and commanding attention. New Englander Cindy House, whose works I always seem to get lost in, certainly did it again this time. 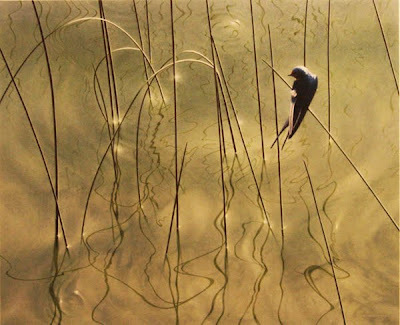 In her tenth year of inclusion in Birds in Art, she has once again presented one of her gorgeous pastel landscapes where the birds, as they do in nature, just seem to suddenly appear and for an instant, command our attention away from the beauty of the landscape and once they have flown on, we return to the subtleties of the colors of the grasses and trees and clouds. Friend, Matthew Hillier's oil of White Ibis, a large work at 24 x 48, reminded me much of my January trip to the west coast of Florida with his deft use of the soft blues and greens of the Gulf. I can not think of many who can make water come alive with sparkle and movement like Matthew does. It is little wonder why his works have been included in the exhibition ten times before this year. 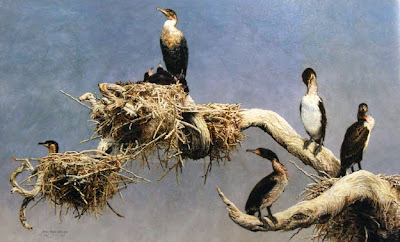 Jenny Hyde-Johnson, from South Africa, brushed a beautiful acrylic painting of White-breasted cormorants perched on a nesting branch. 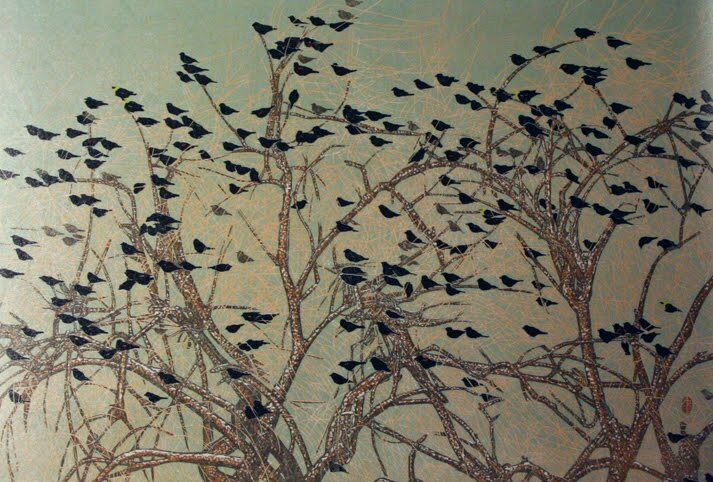 Again, reminding me of time spent viewing rookeries in Florida back in January, I was struck by her wonderful use of light in this work. I also very much enjoyed her compositional design and placement of subjects; a work very much akin to the sort of balanced ideas that I like to work out in my own works. 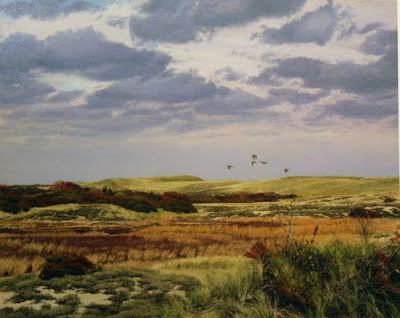 2005 Master Artist Nancy Howe, always embodies such a soft and warm and subdued character to her works that I can not help but to be drawn into the little worlds that she creates in her oils. 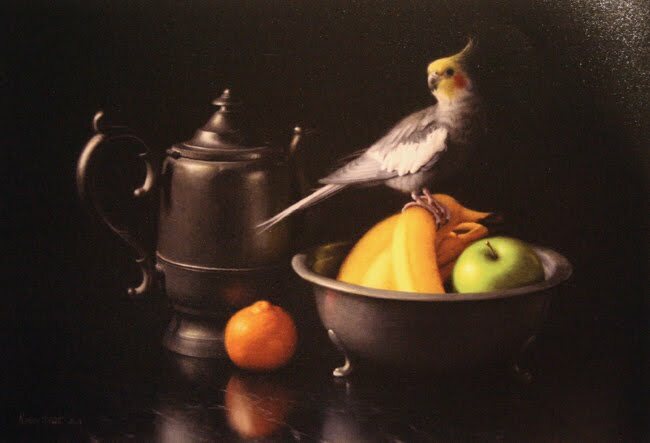 Her own Cockatiel acted as the major subject in this work, a 15 x 22 canvas. 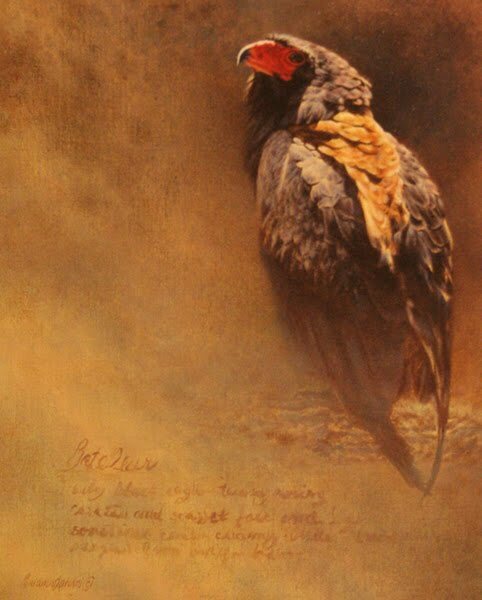 Minnesotan Brian Jarvi's oil portrayal of a Bateleur eagle snagged me as I walked into the gallery in which it was hanging. 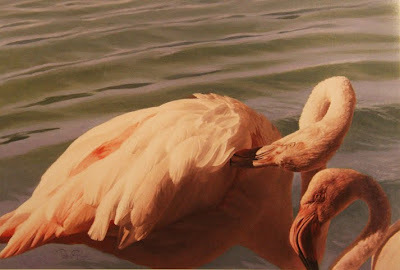 The bird is posed simply yet the way in which Brian chose to light the subject and flesh out the feathering on the bird's back, giving it great depth and dimension, was what did it for me in this simple rendering. Zimbabwe born, South African Peter Gray's oil of Greater flamingos captured me, again, because of his very unique compositional approach. As I have spoken of time and time again in postings here, composition and working out subject balances and arrangements in a pleasing, interesting, unique and appealing way is what always gets my creative juices flowing. I relish seeing that same sort of ethic in the works of other artists and never fail to be drawn into those sorts of compositions. The fact that the work is handled beautifully on other levels, technique, color, anatomy, light and shadow etc., just acts as that much more in my view and this work had it all. 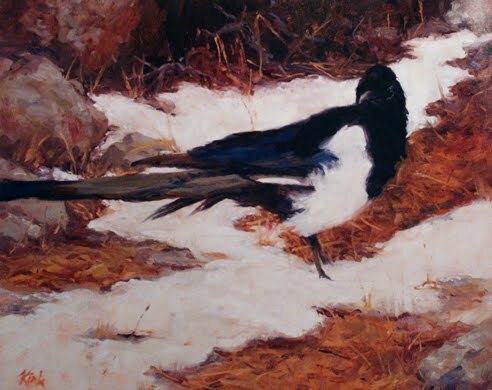 First timer, Dena Kirk of Colorado, really grabbed me with her oil, above, of a Black-billed magpie. Even before I knew, by reading the little blurb in the catalog, that Dena did plein air work, I had the feeling when I first viewed this painting, though it was a studio work, the brush work and immediacy of the capture of the moment just cried of plein air experience and rushed through to my eye. 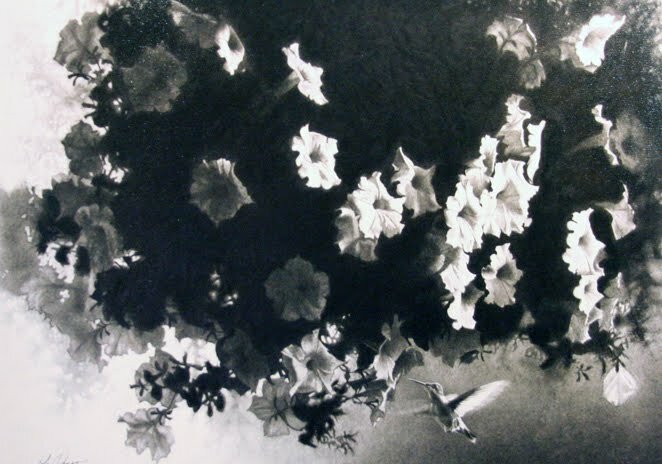 Fellow graphite artist, Cole Johnson's piece of a Ruby-throated hummingbird certainly caught my attention. Knowing that Cole uses a lot of soft, powdered graphite in his works made my admiration for his deft use of it in this work just that much stronger. 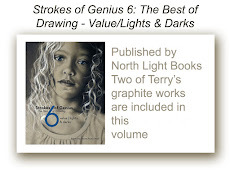 The intensity of the lights and darks and the crisp separations certainly added to the overall sparkle of the work. Sorry you weren't there in person, Cole, for me to pat on the back! Fourth time making the cut, Suzie Seerey-Lester caught me as I walked the galleries with her very moody acrylic of Tundra swans. Another of those sorts of works that really speak to me through their interesting and unique compositional elements and design, this one, another relatively small work at just 12 x 16, held my interest just as much as some of the much larger paintings hanging on the same wall with hers. 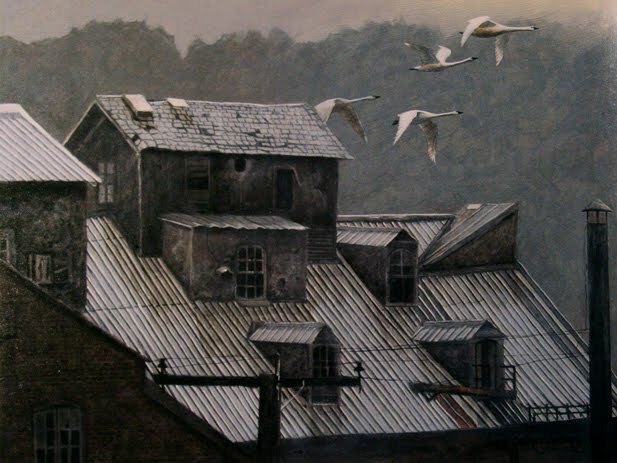 This year's named Master Artist, friend Jim Coe, had a lovely assemblage of almost twenty works in the spotlight gallery. I was hard pressed to point to my very favorite, but after a second look at all, this work above, one of the smaller oils at 16 inches square, kept hold of me. I don't know if it was the color, the design of the work or what, but it turned out to be my favorite of his mini exhibition. 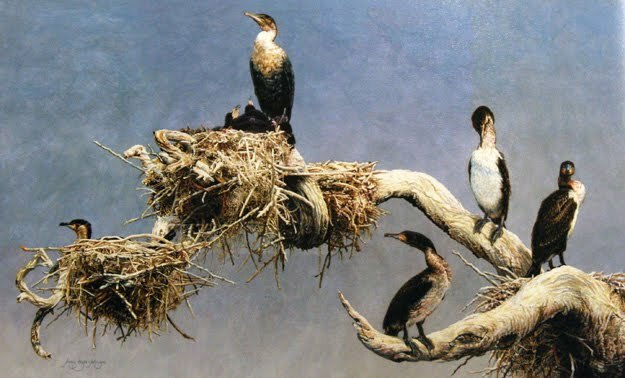 And last, but certainly not least, this stunning work by Robert Bateman, named Master Artist way back in 1982, stopped me dead in my tracks. 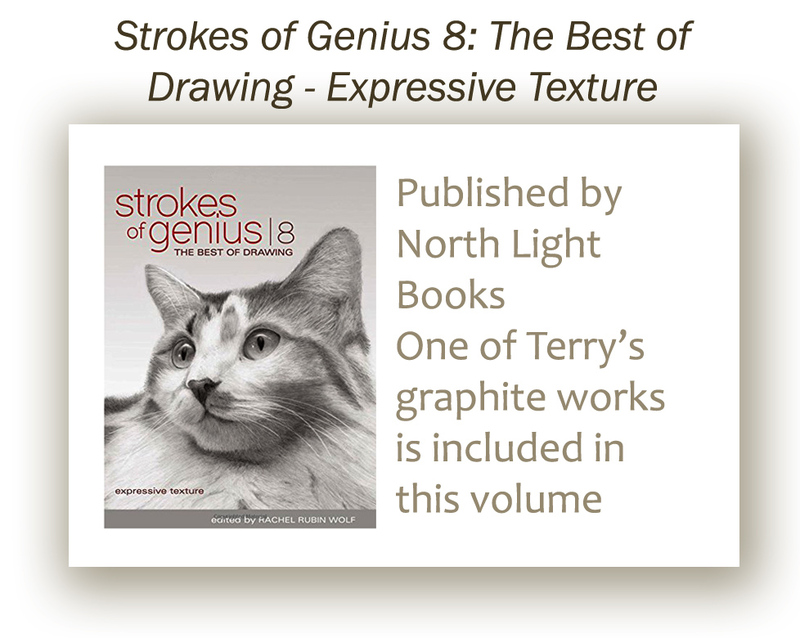 Even now, in his eighth decade, his work continues to amaze and enliven, and spark inspiration. I say it to myself every year after returning from the weekend's festivities . . . what do I do next year? I'm already thinking along those lines, like I am sure are many of the other 66 artists who attended this year's opening of Birds in Art. Little did I consider 20 years ago, when I first submitted a work for jury, that I would ever have been privileged enough to have not only gotten work into 20 almost consecutive (did not make the cut in 1997) years of this well respected exhibition, but that I would have had the chance to meet and mingle with, and share ideas and talk about art and all sorts of things with the likes of Robert Bateman as well as excited and wide-eyed first timers like those that I enjoyed conversation with in Wausau this past weekend. Cheers to all who made this year's 'cut' and to all . . . well wishes for 2012! A reminder that this coming Friday evening, September 16th, is the opening of the Western Visions Miniatures and More show at the National Museum of Wildlife Art in Jackson, Wyoming. I'm pleased to have one of my works included in the show this year. All works are available for bidding and the draw will happen Friday evening. Lots of great work to see and possibly own! 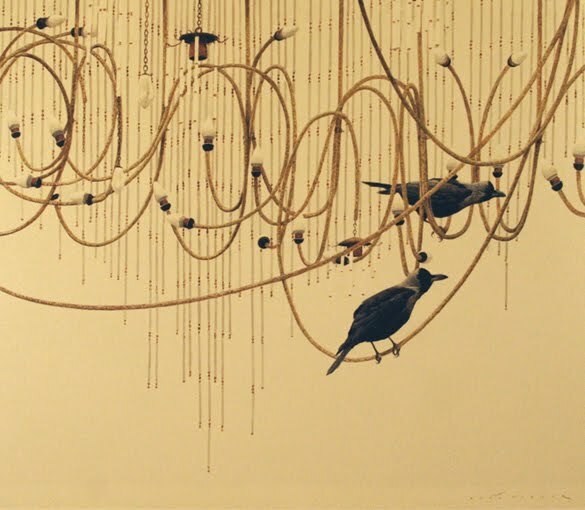 Back from the whirlwind weekend that always is such a flurry of activity at the opening of Birds in Art at the Woodson Art Museum. Seems like, as the years go by, the weekend festivities go faster and faster with hardly time to catch one's breath. This year, 66 of the 112 included artists were in attendance and it was, as it never fails to be, a great time to catch up with artist friends who I generally don't get to see except the occasional posting from them on Facebook throughout the rest of the year. Also, it is great to meet and make friends with 'first timers' and there were a host of them this year. Jim Coe received the Master ribbon this year and one of his gorgeous oils graced the cover of the catalog. 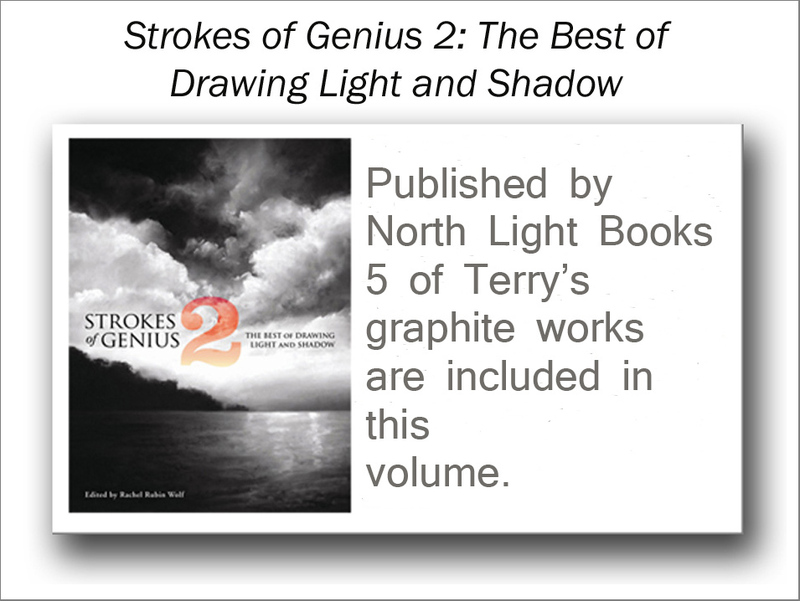 And another past Master, Jim Morgan, named in 2008, and I shared facing pages in the beautiful catalog. 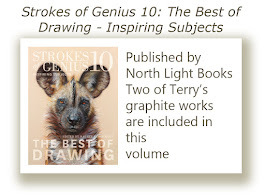 Adding it to the previous 19 catalogs from my, now 20, years of inclusion in the exhibition, brought to mind just how many of these wonderful weekend events I've been privileged to attend since my first year of making it through the jury back in 1991. 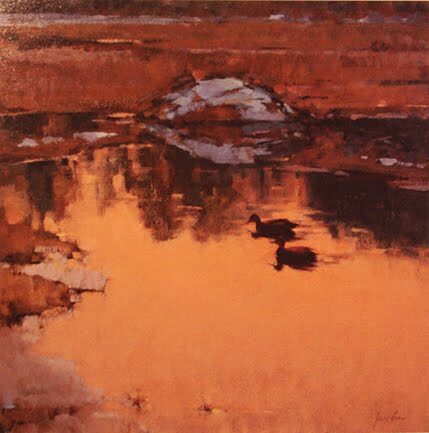 Of course, now it is time to get back to 'reality' and the work at hand, preparing for upcoming gallery events and the big Waterfowl Festival in mid November. Not the time for reflection but for moving on with work. Of course, being at the opening and seeing all that terrific art in person will certainly continue to act as ongoing inspiration in the studio over these next weeks and months as it always has upon my return from this internationally recognized, well respected and coveted exhibition. As I've done a number of times in the past, I will post some of my favorite works from the exhibition in a day or two.
' 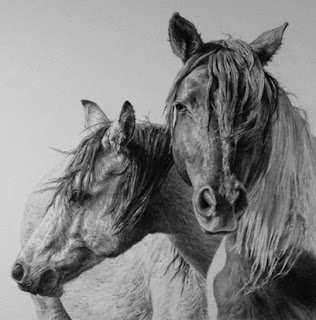 Chincoteague Ponies ' 6 1/4" x 6 1/4"
Headed to McBride Gallery in Annapolis next week for the opening of the next big show, Best of the Chesapeake on Sunday, September 18, reception from 1 to 4 PM. Back to non-Labor Day labors. 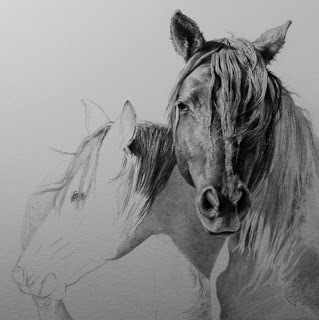 I did manage a couple of hours of time in the studio yesterday and here is where this new work stands after an additional hour and a half of work on it this morning. It's earmarked for gallery delivery early next week, so need to scurry with it. It's Labor Day . . . so, why shouldn't I be laboring? Well, maybe an hour or two in the studio this afternoon at any rate. Here is something that was started over the weekend.